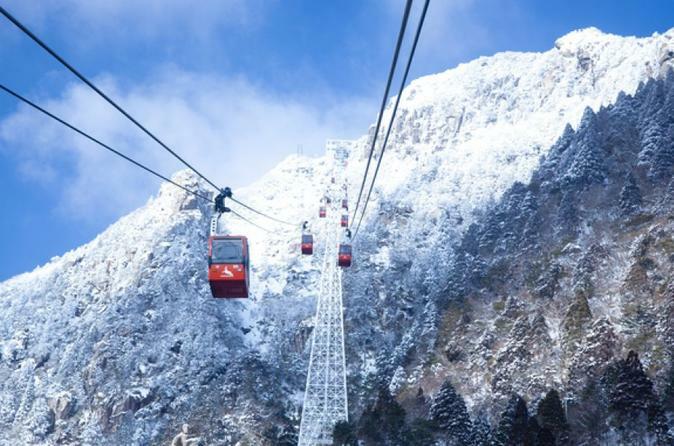 Ride the Gozaisho Ropeway to see the mountain’s famous "frozen tree" and "frozen waterfall" phenomena during this day trip from Osaka. After taking photos of the white landscape, you’ll travel to the Begonia Garden at Nabana no Sato to admire its wintertime illuminations. A lunch of quality Wagyu beef (Matsuzaka) is also included before the trip starts. According to weather condition, there is a chance that "Frozen Tree" & "Frozen Waterfall" may not be seen, in this case no refund will be made. Temperature at Mt. Gozaisho is very cold and may be under freezing point, please wear enough clothing for keeping you warm. Starting time for Illumination will affect the arrival time. If there is delay in returning time, and participants need to call taxi or use other means of transportation for going home, under such condition our company will not take responsibility on the extra transportation fee, please be noted. All items left in the tour bus will be disposed by our company.